The repayment of debt (or default on debt – which is more likely) will result in significantly reduced economic activity. Significantly reduced economic activity will have a negative effect on the stock market, which in this case, will likely result in a huge crash. It is these conditions (a deflating debt bubble) that will drive gold and silver prices significantly higher. Why? Because this will not just be a normal type of reduced economic activity, but one in which the monetary system as a whole is questioned or collapses (due to the excessive debt levels). In a crisis like this, it will be all about preserving value, which will make gold and silver the most wanted goods. The excessive debt levels we have currently, mostly represent artificial value, or value that will never be realised. We now have a great opportunity to convert that soon to be destroyed value into real value, by buying gold and silver, with fiat currency. In my opinion, silver bullion presents the better opportunity, when compared to gold. Silver bullion is still trading much lower than its 1980 high, and also at relatively historic lows against gold. On both charts, I have suggested how the flag patterns might be similar, by marking similar points, from 1 to 6 (and alternatively from a to f). 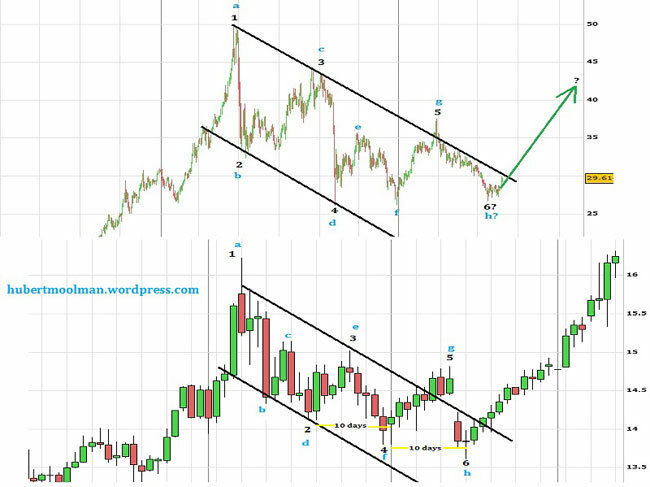 Based on this comparison, it appears that the silver price might now have found that point 6 or h, and is about to increase significantly. See my latest video on my website for more details of this analysis.